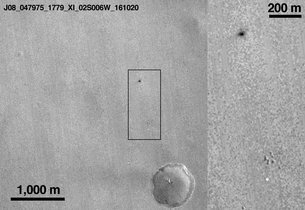 NASA’s Mars Reconnaissance Orbiter (MRO) has identified markings probably left by the impact of the Schiaparelli entry, descent and landing technology demonstrator module on the planet’s surface. 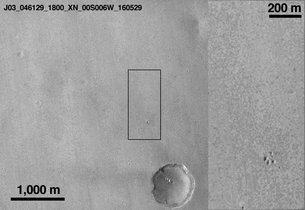 Pictures of Schiaparelli’s expected Meridiani Planum landing site were taken by MRO’s low-resolution Context Camera (CTX) on 20 October. The pictures show two new features on the surface—one bright and one darker—when compared to an image from the same camera taken in May this year. The bright feature is likely related to the 12-metre-diameter parachute used in the second stage of Schiaparelli’s descent, after the initial heat shield entry. The darker feature is roughly 15 x 40 metres in size and about 1 km north of the parachute. This is interpreted as arising from the impact of the Schiaparelli module itself. The two new features are located at 353.79 degrees east longitude, 2.07 degrees south latitude on Mars. The position of the dark feature shows that Schiaparelli impacted approximately 5.4 km west of its intended landing point, well within the nominal 100 x 15 km landing ellipse. What happened to Schiaparelli on landing? 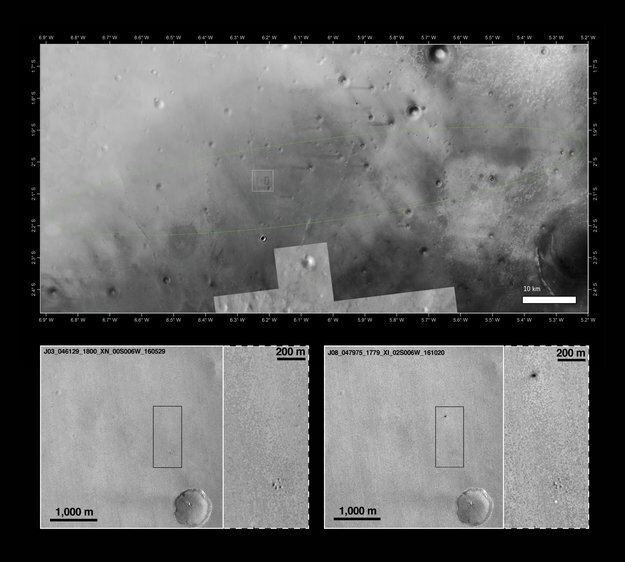 Schiaparelli entered the Martian atmosphere at 14:42 GMT on 19 October for its 6-minute descent to the surface, but contact was lost shortly before expected touchdown. Data recorded by its mothership, the Trace Gas Orbiter (TGO), are currently being analysed to understand what happened. Estimates are that Schiaparelli dropped from a height of between 2 and 4 kilometres, therefore impacting at a considerable speed, greater than 300 km/h. It is also possible that the lander exploded on impact, as its thruster propellant tanks were likely still full. A closer look at these features will be taken next week with HiRISE, the highest-resolution camera on board MRO. These images may also reveal the location of the front heat shield. Since the module’s descent trajectory was observed from three different locations, the teams are confident they will be able to reconstruct the chain of events. The exact mode of anomaly on board Schiaparelli is still under investigation. Meanwhile, the teams continue to decode the data extracted from the recording of Schiaparelli descent signals recorded by TGO in order to establish correlations with the measurements made with the Giant Metrewave Radio Telescope (GMRT), an experimental telescope array located near Pune, India, and with ESA’s Mars Express satellite from orbit. The ExoMars TGO orbiter is currently on a 101,000 km x 3,691 km orbit (with respect to the centre of the planet) with a period of 4.2 days, well within the planned initial orbit. The spacecraft is working very well and will start taking science calibration data during two orbits in November. It will then be ready for the planned aerobraking manoeuvres starting in March next year, bringing it into a 400-km altitude circular orbit around Mars. The TGO will then begin its primary science mission to study the atmosphere of Mars in search of possible indications of life below the surface, and to act as a telecommunications relay station for the ExoMars 2020 mission. ExoMars 2016: Perfecting the Trajectory!